We've all been there, you're trying to post a blog post for the first time this week, to no avail. You're staring at a blank screen wondering why you even bothered starting a blog you couldn't maintain. Maybe it's not a blog, maybe it's that essay that's due, or a creative project you've been meaning to start but don't know where to begin. Don't stress about it, I've put together a list of 8 way to help you find inspiration. There’s something about being out in nature that’s so relaxing, it just calms your mind. It’s a feeling that’s both uplifting and soothing at the same time. I find the patterns on leaves & trees, the vibrant colours of flowers and the variety of insects & birds that live amongst it - a world away from work & wifi. Nature can be the most interesting subject or background in a photograph, as its something that’s becoming more and more surreal as we enter an increasing metropolitan society. In complete contrast to the above point, cities can be a great way to spark your creativity or as a way to boost your motivation. Whether it’s steeped in history, has a modern feel to it or both - from the shapely gothic arches to the glass-panelled havens of shopping centres, sometimes simply being amongst the urban bustle can be enough to rejuvenate and freshen your mind. I remember when I went to Birmingham after they’d finished renovating New Street and I was just in awe; billboards, mirrored panels and little flowers dotted about. Pinterest is bursting with visual inspiration on all topics - blogging, photography, art, poetry, fashion, beauty and so much more. 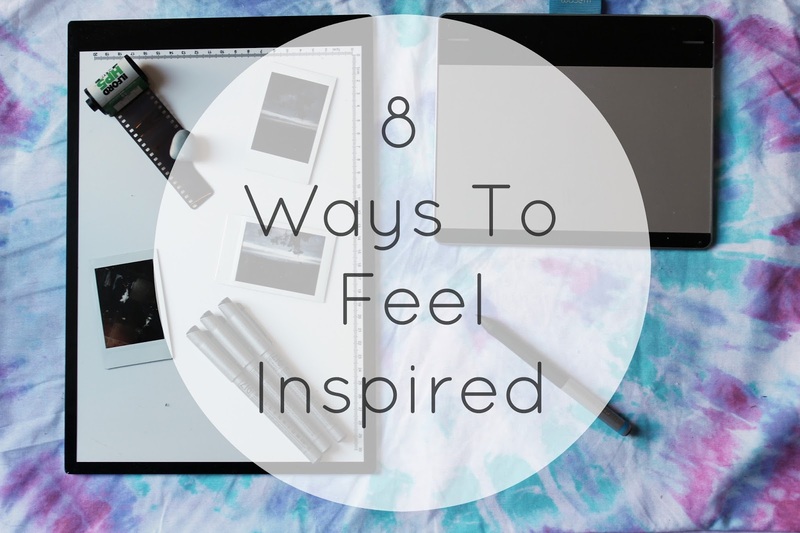 You can pretty much create your own inspiration mood-boards on the site and it’s guaranteed to provide fresh, new ideas that you may not have thought of. Documentaries are probably my favourite type of programme on TV, as you can take in a lot of information whilst being entertained. They can create topics of conversations (for blog posts perhaps), provide new perspectives on topics and even act as a starting point for projects. It could be a fashion show in a nearby city, an art gallery, a blogger workshop or even a music event like a concert or festival. Whatever it is that appeals to you will be more than likely make you come back with heaps of inspiration. If it relates to your blog, even better as you’re going to find a lot of relevant inspiration there. Music has the power to make you feel a whole bunch of different emotions, I’m normally quite tactful with what songs I’ll listen to based off what emotional response it’s going to give off and how that can help with what I’m doing. If I’m writing poetry or prose for example, I’ll put on a song with lyrics that have layers of meaning. If I’m wanting to draw, I’ll put on relaxed music and see what comes of that. Music can be a great starting point for opening the door to your own creativity, as well as providing a lot of inspiration within the emotional response it creates within the listener. It can be near or far, busy or quiet, urban or rural - it doesn’t matter. As long as you’ve never been there before. Head there and see what awaits. If you try and force ideas out, chances are the idea just won’t formulate or you won’t be happy with what you’ve produced. Stop whatever you’re putting pressure on yourself to do for a little while and relax, maybe do one of the above suggestions. Music ALWAYS inspires me. It's one of the few things in this world that can cheer me up almost instantly when I'm having a bad anxiety/depression day or just whatever is going on. I really want to go into the city again soon as well! It always makes me feel alive! I made a blogging playlist on Spotify for when I am desperate for some motivation. I like to also go for walks with my camera sometimes to get some shots for my instagram or make them for a post that I was given inspiration for. I find that helps a lot. Blogging breaks really helps as well. I schedule my posts for weeks in advance sometimes so some weeks I don't need to write content and can take a break. "You're staring at a blank screen wondering why you even bothered starting a blog you couldn't maintain." This really hit home. I've recently published my first blog post in MONTHS and for a really long time I felt like I didn't even deserve to call myself a blogger. Inspiration is a very fickle thing and I'm sure we all have moments where it just won't come to us, but I'll be looking back at this list in times like that to get myself going again. I also would've never thought of watching a documentary to inspire myself, but that's actually such a great idea! I love exploring new places, wandering through forests and visiting my library for inspiration! This is such a great list!